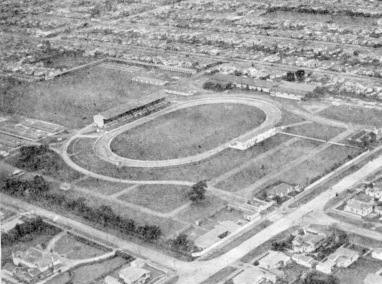 Other tracks running in the 30's were Kilbirnie (Wellington), Western Springs (Auckland), Monica Park (Christchurch) and a track in Dunedin. 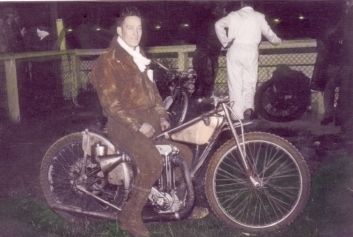 Following on the successful introduction of motor cycle dirt track racing in the four main New Zealand city's, popularly termed "broadsiding," a track and the necessary equipment will be installed on the Show grounds in the course of the next few weeks. Mr. Roy Johnston, a director of the four companies at present in operation in New Zealand, is it present in Palmerston North finalizing arrangements. The track will be 440 yards in circumference, precisely the same as the tracks laid down in other cities. It will be surrounded by an approved type of safety fence and will be lit by 57 lights of 2000 candlepower each. Provision is being made for a full size football playing area in the centre of the track. Additional lighting will also be installed in the two existing grandstands. Every opportunity will be given to local riders to become proficient in the art of broadsiding, and practices under the supervision of an expert will be held prior to the opening night. 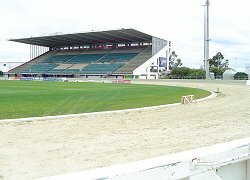 It is intended to race in Palmerston North on Wednesdays and this arrangement will enable the best overseas talent to appear here as the other tracks race on Saturday nights. In this connection an official team of six star broadsiders from England is at present on its way to New Zealand and will be seen in action here in addition to the Australian riders. "What about noise," Mr. Johnston was asked. "This is purely a bogey" he replied. "Our stadium at Kilbirnie, which has just entered on its third season, butts on to the back yards of residents and no complaint has been received since it commenced. All the machines are fitted with an approved type of silencer. 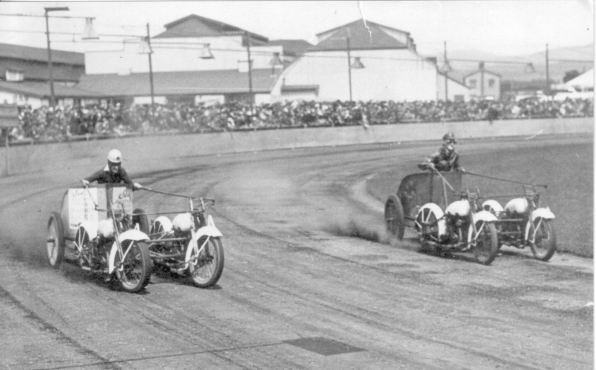 The track is not banked, as is generally supposed by those who have not seen broadsiding, and it has s superficial dressing of loose material which is watered so that frictional resistance between tyre and cinders may be amplified". "For appearances on the track scratch riders are to be paid appearance fees of £7, for one second riders, £4, two second riders £3, while all A grade and B grade contestants are to receive £2 and £1 respectively. 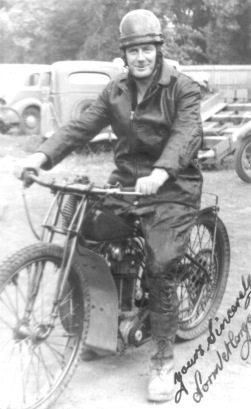 A benevolent fund, provided by the deduction of 2 ½ % of the gross takings is instituted to defray hospital expenses and the allocation of £4 and £2 10 a week for married and single riders respectively in the event of any mishaps." 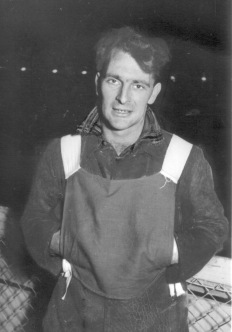 This photo at Palmerston North shows Jackie Hart on the outside, who rode for Exeter in 1953/55 with Trevor Redmond from Christchurch who also had a successful career in England. 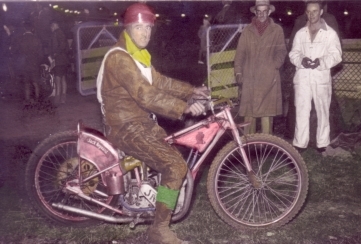 The first race on opening night was won by Herbert "Dare Devil" Durkin from Australia from J Hassell of Wellington and the grand final was taken by Eric Hamberger with Eric "Flat out" Whittle also from Australia in second. 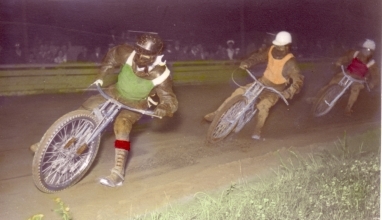 Kiwi Cribb shown right was an early rider at Palmerston North who was the father of Bruce Cribb who competed in England. 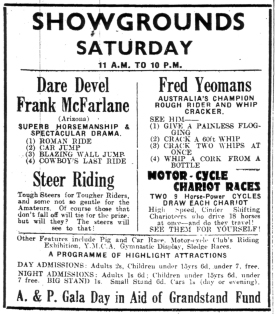 In early 1939 the interest in Speedway was fading so the show ground owners, the A & P Society arranged a variety day which included "Chariot racing"
There were two chariots each powered by two Harley Davidson bikes. We have no report of how they performed. They are shown at right in a newspaper photo. The chariots were built by a local company Pink & Collinson. 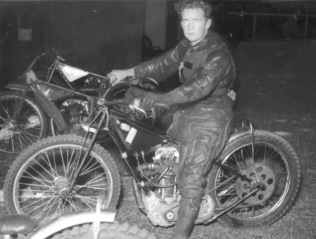 One of the 'drivers' was Murray Andrews who also rode solo bikes. He attended the recent 75 th Jubilee. See also Personal notes on PN speedway. 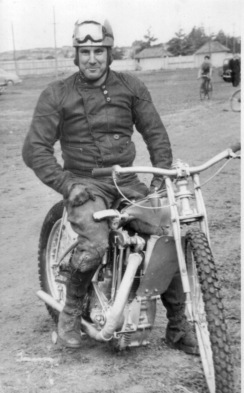 See also "Bits 'N pieces"
Two more riders were Chic Davies and Colin Patterson (below). 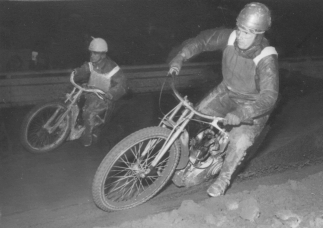 Below are Ronnie Moore leading Peter Pollett and Jackie Hart. 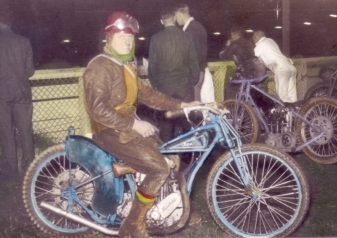 Below are riders who appeared at or were contracted to Palmerston North in the 1950's or earlier. Eric Pinker on right and below on left Harry Mangham on right Len Perry. 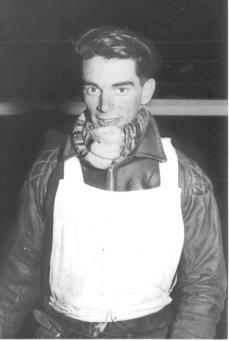 Peter Pollett who rode back in the 1950's against many of the riders on this page helped me with tha riders names and mentioned that Len won more NZ Championships in all forms of racing than any one before or since. 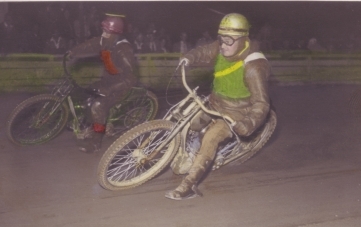 Below left is Maurice McHugh, centre is Norm Morgan and right is Chick Davies. Left is Trevor Redmond from Christchurch. 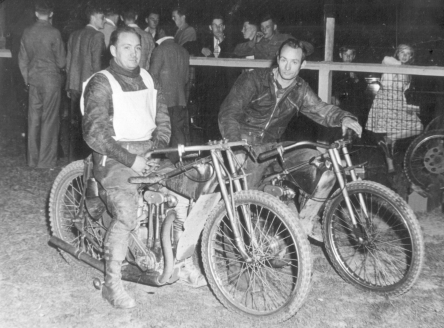 Right are the Craven brothers from England while at Palmerston North in 1949. Malcolm on left and Gil on right. 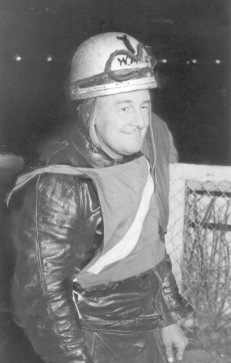 Read some personal thoughts about this track by Barrie McBride of Trentham.